Genetic Veterinary Sciences, Inc., the parent company of Paw Print Genetics, announced today that they are open for business. After completing the development and validation of 86 tests for inherited diseases in dogs, Paw Print Genetics is receiving orders from dog owners and breeders to identify mutations in genes that cause medical problems in dogs. The company is celebrating their launch with an open house on May 17th. "Our tests should be used prior to breeding or buying a new puppy to reduce the chance of devastating illnesses and costly medical bills" said CEO, Dr. Lisa Shaffer. "We understand that having a dog is an emotional, time-consuming and costly investment. Our tests can help reassure the owner that their dog will live a healthier life."" Paw Print Genetics' service is unique in the industry in that they offer a Canine Genetic Health Certificate© that shows which diseases the dog has been screened for and their results. This certificate can be sold with the dog so that the new owners are informed regarding risks for genetic disease. In many cases, the results will show no risk for specific inherited disorders, which is good news for their new puppy. Located in the McKinstry Innovation Center in the University District of Spokane, Paw Print Genetics has a staff of two PhDs, a licensed veterinarian, and master-level technologists. The company provides clinical testing to dog owners, breeders, trainers, service dogs and researchers. 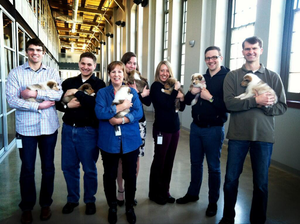 The company plans expansion into broader genomic health issues of dogs and disease discovery.